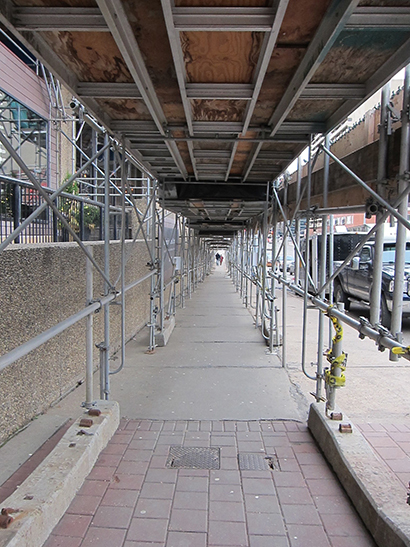 Will the City of Edmonton Get Real on Sidewalk Hoarding? At times, as you walk along those wooden pathways reminiscent of old-timey boardwalks, downtown Edmonton feels like Fort Edmonton. Construction hoarding—especially those dead ends with bright orange “Sidewalk Closed” barriers—permeate the core. The list of downtown sidewalks that have become adventures in detouring is too long to name, but a few stand out: the 7th Street Annex, whose glacial construction on 104 Ave. has frustrated MacEwan students from junior year to graduation; or the City of Edmonton’s own new office tower which hogged the sidewalk for most of its construction, forcing pedestrians to criss-cross through the Ice District or (illegally) walk with traffic. But with more people living downtown—and intent on using their feet—the City is finally ready for change. A proposed policy in 2015 could force builders to keep sidewalks open or relocate them in the streets, whenever possible. It’s the first attempt to balance pedestrian needs with traffic flow and construction work. Prior to the proposal, and amidst the downtown construction boom and residential resurgence, hoarding became a major issue. The Fox Towers on 104 St. were the breaking point for residents. Construction consumed one of two laneways, but also made it impossible for people to walk along what’s supposed to be a key downtown attraction. “When you see a sidewalk that you use all the time disappear, you’re more likely to raise a fuss about it,” says Ward 6 Coun. Scott McKeen. In the summer of 2014, McKeen, on request of his constituents, asked administration to investigate a better way. Up to that point the city had no policy on how sidewalk hoarding affected pedestrians—only on how it affected traffic. “It’s a symptom of regulations that don’t fully consider people,” Max Amerongen from Paths for People, an advocacy group for active transportation, explains of the policy currently on the books. The closed sidewalks aren’t just an inconvenience but evidence of a disconnect between the pursuit of walkability and the reality on the ground. Instead of squeezing a lane of trafc to open a pedestrian path, it’s been easier for the city to shut down the sidewalk. “[The policy] was a fairly small decision to say we have to look at ways to ensure there are still safe sidewalk areas for people,” says McKeen. The investigation into practices revealed an internal communications failure. Project approvals require numerous departments in the process. Building permits in sustainable development evaluate the developer’s need for space and ensures the permit works with Alberta Safety Codes standards, while transportation evaluates access for pedestrians and vehicles. Yet the two didn’t communicate effectively, so as construction plans were approved by sustainable development, there was little opportunity for other departments to include pedestrian and transit access. Hoarding would obstruct sidewalks and bus stops. The main result of the 2015 policy proposal is that it would make departments aware they had to talk to one another and, hopefully, do better. “We recognized that we need to circulate [information] to a lot of areas—parks and rec, overhead power lines, transit,” says Roger Clemens, who oversees building permits in sustainable development. Previously, his department would overlook how construction affected a bus stop or alternate walking routes. Now there is some advance communication to prevent some of these oversights. It’s still hard to detect real change because many of the construction boom’s developments were approved before 2015. Soon, however, we’ll see much more consideration given to the pedestrian experience, as builders are now encouraged to consider pedestrians more. It’s the best the City can do until policy approval, but the proposed laws could go further. In cities such as Toronto, developers are required to use vertical space, building space up instead of out, to hold construction equipment and worker space. Edmonton’s future doesn’t encourage this option, nor does it charge a fee structure that would penalize contractors using sidewalk space, a major incentive to overlook pedestrians. There is also no way to measure if a balance between pedestrian needs and traffic is being met. Brad Vanderhoek, with traffic control, says that as the City emphasizes walkability in more planning processes, the solutions to sidewalk obstruction could become easier. Initiatives such as the recently passed minimum grid for bike lanes and Vision Zero (a pedestrian safety initiative) will begin to integrate pedestrian and cyclist access everyday, he says. But for hoarding specifically, design requirements could set minimum standards for pedestrian-friendly detours and could lessen the amount of public space that’s hoarded. Perhaps most effectively, a fee structure that charges companies more for using sidewalk space as much as it does roads would help to keep companies accountable. One suggestion made in the early stages of the development of the 2015 policy was to discount fees for companies who created visually appealing hoarding. Samantha Power is an Edmonton-based freelance journalist and editor. She's contributed to Now Toronto and The Tyee. This entry was posted in 2016 Winter, Core Questions. Sign up for our scintillating monthly newsletter! Get news about when our next issue hits your mailbox.